During the initiation into the 4th level of the Inkan priesthood, the Hatun Karpay, we became "Inkan seeds." On the second day we'd hiked down to a small cave where we exchanged energies, absorbing the energies of the soil and earth up our spines in which to "plant" our "seeds." In the days following our first two days of intense rituals, Juan took us to sites where we exchanged energies and used spiritual water to help our "seeds" germinate and finally we did a ritual at Machu Pikchu to allow our young "plants" to "flower." More on this later. As I mentioned earlier, due to last-minute airline and hotel snafus, Juan had to modify our schedule--so what's printed on our brochures isn't the order in which we visited the sites. But Juan is very flexible. So he managed to take us to all the sites anyway and maintain the proper order of first creating our "seeds," then providing them with "soil" and "water' for proper nourishment, and then "flowering," even though we probably used some of the sites for purposes other than what Juan had originally intended to do at each. Since I felt that linear time got all scrambled up and became cyclical, I now have only a faint idea at which site we did which step in the caring for our newly-planted "seeds." Sometime in the future, I hope to find time to listen to the many tapes I tried to make of Juan's lectures. That will take some time, of course. (Can't seem to get away from the word 'time'!) Since the wind blew fiercely at several sites, I'm not sure how much interference I have on the tapes, either. Juan is very soft-spoken. If you ever want to go on this initiation with him, bear this in mind! 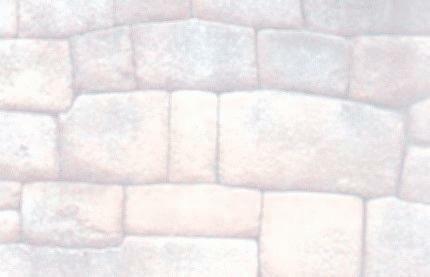 On Day 2, still in Cuzco, we visited the ruins near Pisaq. To get there, the bus deposited us in a small parking lot and we were to hike part of the Inka Trail. Click to view full sized image, width=1868 px height=1229 px size=384.92 kb. But first, according to my scribblings, on the way we visited a large stone wall that had five niches. One at a time we visited each niche and opened our poq'pos or auras to the energies of each niche. The 1st and 2nd felt 'dark,' but different from each other. At the 3rd I felt white light; the 4th produced red light and the last produced a dull, red-brown-orangish light. Then we turned around to face a string of mountain ridges and peaks slicing across the horizon that represented 5 apus. Juan told us each apu is connected with one of the niches! The apu at our left as we faced these mountains is feminine and its name means something like "Pink Blanket" or "Pink Princess." Juan said that each February finds that peak clothed in pink wildflowers. There used to be a celebration in which women would climb up there and gather bouquets of those flowers for use in a ritual. He didn't know whether that festival is still celebrated. The "Princess" apu corresponded to the niche which had seemed to emanate the dull red-brown-orange light. The apu which was connected with the niche of the red light looked sharp, like a knife blade lying on the horizon. The white light niche corresponded to an apu with a cone shaped peak, terraced on one side. 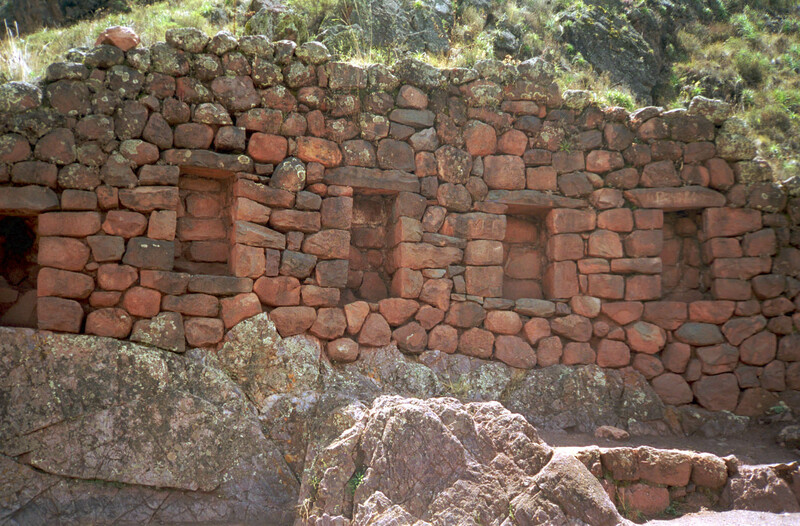 One of the dark niches had an aputhat looked like a face lying on the horizon, while the other dark niche was connected with a small peak a little distance from the others. While we faced the apus, we drew into our qosqos or navel centers, lines of energies from each apu. I felt and 'saw' these energies coming from each apu as lines of golden-white light. A tiny tingling manifested in my qosqo, but that's all I felt there. Then we made a hard descent to a small cave-like opening amongst some huge boulders. It was difficult for us to crawl into the small space are arrange ourselves so that we all had seating room. I wasn't very comfortable. Here we meditated and absorbed the soil-earth energies from Pachamama for our Inka "seeds." I also 'saw' my "seed" germinate, sort of like in time-lapse photography. We then climbed back up to the trail and went to the ritual baths - and I think this is where we absorbed the water sami for our "seeds." I felt the sami wash through my physical body and aura - in through my head and out through my spine and feet. And again 'saw' my 'seed" germinating. After this Juan told us we'd been hiking on part of the Inka Trail! All I knew was that I was again getting worn out and my knees and ankles were starting to hurt and my lungs just couldn't seem to take in enough ozygen to keep my body going. At age 66 I was the oldest person in our group. Juan was 53, but of course is used to the high altitude. Since he leads some 20 groups a year on this Hatun Karpay initiation, he's in great shape. I had worked out on a bike for two weeks prior to the trip, but that just wasn't enough to get my body in shape, since I live near sea level and had been fairly sedentary for seven years. As I'd been active all my life until seven years previously, I had no idea that a body could degenerate so fast! So a word to the wise--if you wish to go to the Andes or other mountains at 8000 to almost 12,000 feet, better take a year to prepare your body if you've been sedentary for a few years. The other woman near my age, Pat, had to drop out totally this day, so Juanito escorted her back to the bus, then came bounding along to catch up with us. Oh, to have energy like that once again! I was having great problems trying to climb those hard, hard stone steps in the high altitude. My lungs just couldn't seem to get enough oxygen to do the job. Manuel, seeing my distress, rescued me, lending me some of his boundless energies and helping me along. Without him I never would have made it! 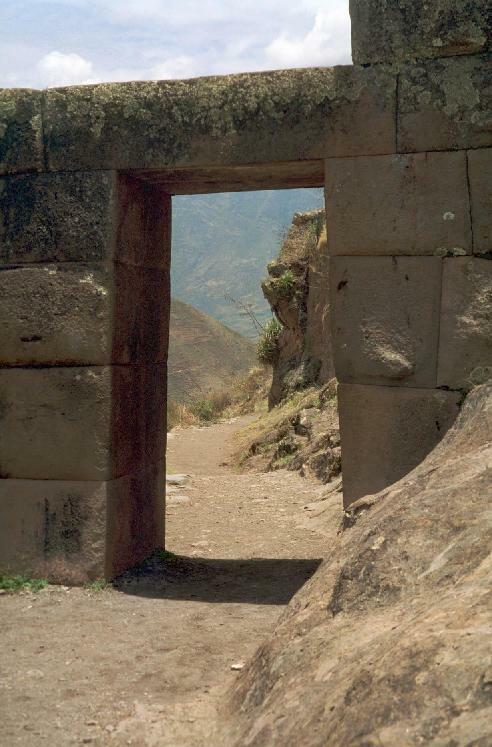 The restored part of the Inka Trail proceeds for miles and miles along the sides of mountains. At one time there were over 10,000 miles of useable roads that connected all parts of the Inkan Empire. But just the little bit of a mile or so that we encountered was enough for me! This part runs along the steep side of a mountain. First we had to climb steadily up and up. I kept thinking that it'd be easier going back to the bus, all downhill. From this very high vantage point, we looked way, way down into the valley at the little town of Huaskar where Juan's master used to live, the winding roads, the parking lot filled with buses and people. Jumbled sounds from all this filtered up to us. After a time we approached a stone gateway in a wall that sliced straight up the side of the mountain to the trail and up even beyond it. Looking through the doorway/gate that marks the division between the 3rd and 4th energetic levels. Photo taken from the 3rd level side. Click to view full sized image, width=1229 px height=1867 px size=253.1 kb. Juan stopped us. On this side of that gate, he said, the energies are of the 3rd level, including the ritual baths we'd just visited. He asked us to stand on this side of the gate and feel the energies all around us, then slowly walk through the gate and feel the energies on the opposite side because on that side the energies are of the 4th level! One by one, we went through the gate. Not quite knowing what to expect, I felt the energies on the 3rd level side, then stepped slowly through the gate. The stones were only a foot or so thick and the wall wasn't very tall except at this gate, so I didn't really expect too much difference. What a surprise! Suddenly the sounds from the valley far below became crystal clear! I could hear individual voices, actual words--a flute being played, dogs barking, car and bus engines, doors shutting, wild birds singing, sheep baaing, etc! Quite a difference from the muffled quality of the sounds only a foot or two away on the other side of the gate. On this 4th level side my fingertips tingled! The very air seemed clearer and fresher, too! I felt a small surge of energy coming into my physical body--for which I was extremely grateful. When we'd all gathered on the 4th level side of the gate and shared our amazement, Juan told us that the Inkas had perceived the differences in the energy flows up and down and across the mountains and river valleys and had constructed walls to mark the boundaries of these flows. Why they did this, though, Juan didn't explain. We moved (I huffed and puffed) further along the trail to a narrow tunnel through the rocks, which, I think, represented the boundary between 4th and 5th level energies. There was also something about going through a birth canal (in the tunnel), but my physical discomfort took precedence in my memory! All I can say is that the 5th level is even more refined than the 4th. It gets to the point where words just aren't sufficient to describe some experiences. At long last we came to a point in the trail where we could look down upon some temple ruins. The trail actually headed downhill! No more climbing up and up and up! Juan allowed us to proceed the rest of the way down the stone steps at our own pace, telling us to gather at a particular place. I do believe I was the last one to join the group as by this time Manuel figured I could make it on my own and had gone on ahead! I think Juan called this a Temple of the Sun. We performed some more rituals here. We women went into a temple on the 'left' side while the men entered the one on the 'right' side. The members of each group blended their poq-pos with each other and absorbed the energies of that temple. Then the women entered the 'neutral' temple between the left and right temples. We formed a U-shape with the open end facing the doorway to receive the men into our center. They were four, Juan and Juanito, Manuel and Henrik to our nine! They formed their own tight little circle, standing close to each other. We women then closed our circle and moved closer to the men and joined arms surrounding them. The men absorbed our feminine energies while we absorbed their masculine energies. I didn't feel very much during this process--perhaps I was too physically exhausted. Next we visited the 'moon rock' and laid our hands on it--and here I did feel soft, supportive energies which I absorbed. Then on to the very large rock representing the sun. Here as we perched here and there on boulders around the sun's altar, Juan used his mesa to open our heart centers. Then, one at a time we sat in a 'chair' that the Inkans had carved from a side of this rock and released our hoocha into the rock. Fortunately for me, Eddie had moved the bus to a much lower parking lot, so all we had to do was continue down to the bus. I doubt I would have made it had we had to climb back up and retrace our steps along the Inka Trail! Even going downhill, the journey to the parking lot took a while, but we finally made it. I was very glad to be able to sit down on something soft! Although it was getting late, much to Manuel's delight we voted to stop by the only extant feminine temple left from the hundreds that used to dot the valley. Juan said Manuel had discovered this temple and was overseeing its reconstruction. This was a bonus side trip that most people who come for the Hatun Karpay initiation don't get to go on. The Inkas constructed the masculine temple complexes on square or rectangular foundations, while they erected the feminine temples on round foundations. But looters systematically destroyed all the feminine temples they could find (and many masculine ones), looking for hidden silver and gold. So this is why until fairly recently archaeologists felt there were no more feminine temples left. Inside this round temple we could feel the softer feminine energies as soon as we stepped through the doorway! We invoked the moon's sami here. Several of us women stood for quite a while here, just feeling the energies, knowing we were probably the first women in hundreds of years to have stood here and meditated with our focus on the moon's energies! Near this temple is a humongous boulder. Juan insisted that we all climb up to the top of it. I said no way could I get up there, even with the rest of them hauling me up. So I stayed down at its base while the group went up. On top of the rock the Inkans had carved a small 'lake' that received water from a channel from the nearby mountain. This water also went to irrigate the terraces that are under reconstruction below the temple. Manuel pointed out the course of the water channel down the mountainside. Atop the rock the group connected with the energies of the anaconda and the mountain's apu and pulled these energies into the water in the depression. Ali and Linda called to me to look up and then 'baptized' me with some of that charged water! I hadn't expected this little treat! It really felt good, even though the water and the air were cold. By this time it was almost dark. As we headed back to the bus, we passed a small stream and got bombarded by a whole flock of flying beetles! But usually in the Cuzco area and the Sacred Valley, we didn't encounter many bugs. Perhaps they come out later during the summer, which in Peru occurs in December through February.